TheNextWeb just published a very interesting interview of Xiaomi's co-founder and president, Bin Lin. His comments are consistent with my thoughts about Xiaomi's business model and inherent strengths. Let's take a look at a few of his quotes and what they tell us about the future of this company. Most of the product features that people are feeling are really the software and the services. Users like the software, they like the experience, they like how they get onto the Internet and browse the Web, how they download the APKs. They play games that run really smooth, they take pictures — great images… We have to do a great job building a great product (software) before any of the other things can work. We are the only company who does that: being super open and embracing user feedback and upgrading (our software) every week. We are the only company; no others. That’s exactly the reason why we have built a group of fans that are super loyal to us. They don’t get any reward by giving us feedback and trying things. I think the sense of ownership and a sense of being part of the effort to improve the system, improve the handset, make them feel being respected and make them feel being part of it. So it’s the sense of participation that will get them involved into the discussions, and by nature that’s also the reason they become a big fan of us. In my previous post, I showed that Xiaomi users are about twice as engaged as other iPhone/Android users. This is primarily driven by the fact that Xiaomi users belong to a favorable demographic, i.e. early technology adopters. These users also tend to be extremely vocal about their product choices and as a result, word-of-mouth has become a very strong marketing channel for Xiaomi. I also see somewhat of a parallel with Dell in the late 90s - Dell had realized that hardware quality had reached market expectations, but the retail interface and customization options were still limited. This is what Dell sought out to fix with its online model. Motorola has been moving in the same direction with the Moto X. But Xiaomi has taken this concept a step further, as it has allowed users to provide actionable feedback or essentially "customize" the software itself. We actually have hundreds of thousands of phones in the States. We couldn’t sell to the States because of logistics — shipping only allows shipping to China cities — but somehow through analysis, we figured out that there are hundreds of thousands of phones in the US. Few people know that Xiaomi already has an international presence - both via devices and the MIUI firmware that is distributed online for free. On a smaller scale, this suggests that Xiaomi's model does have international appeal. Also, it seems as though Xiaomi phones are just slightly outnumbered by Windows Phone devices in the US. This quite surprising as Windows Phone devices have received fairly strong marketing support from AT&T, Nokia & Microsoft, while Xiaomi hasn't even attempted to market to US consumers. Different regions, different countries’ consumers will have different needs. (We need to) understand what these consumers want when it comes to software design, and even some of the hardware design and some of the Internet services that we provide, and we have to do a great job adapting to international users before we can actually sell it. So that’s why we need Hugo, with really in-depth product experience. He’s one of the best persons in the world able to do this. To me, this was the single most important comment from Bin Lin's interview. 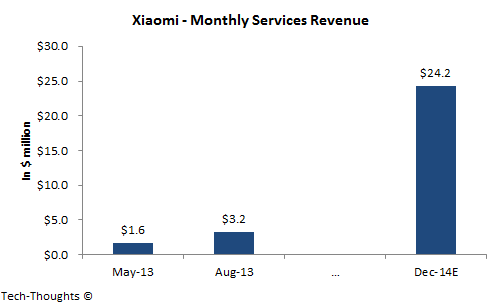 Xiaomi's long-term strategy will be to customize their software & services based on regional preferences. Combined with their use of consumer feedback and services-focused model, this presents an asymmetric attack on leading smartphone companies that will be difficult to defend against. However, this will also be challenging to implement as Xiaomi continues to expand. Will Xiaomi Need to Fork Android to Achieve Localization? The biggest worry for Android is the fragmentation. That people will take a branch of Android, fork it off, make a bunch of changes and then never go back. So as Android evolves, then you have a branch of Android that also evolves, and it becomes so distinctly different then apps built for this Android version doesn’t work on the other version of Android. That’s what concerns Google. But MIUI phone – since day one, we’ve never done that. We make a system that always follows Android updates closely and for many occasions, we have upgraded together with Android’s updates. Since customization is at the core of Xiaomi's value proposition, some may think that they would be tempted to "fork" the Android operating system. However, Xiaomi seems to realize that the path to international success hinges on full compatibility with applications (and by extension, Google services like Play). In fact, compatibility and quick firmware updates are some of the key reasons behind Xiaomi's appeal to the vocal, early adopter community. And by extension, customer loyalty and word-of-mouth marketing are some of the primary reason behind their rapid ascent. We think of hardware as just a platform to run services. We don’t look to make money on the hardware, we are looking at users who have bought the hardware, then started to use our services… It’s the services that eventually bring in revenue. I have always harped on the fact that high hardware profit margins are not a sustainable trend, even for industry giants like Apple & Samsung. Over the next few years, the companies that succeed in the mobile industry will not be those that follow an integrated approach to hardware & software, but rather those that have the capabilities to leverage dominant platforms to deliver and monetize over-the-top (OTT) services. 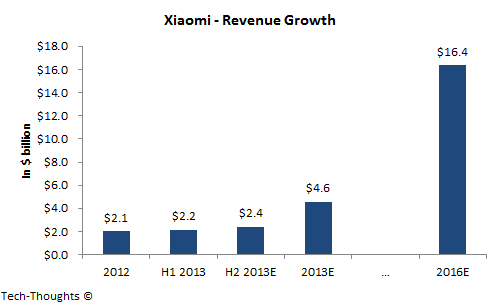 Xiaomi looks like the ideal case study for studying the effectiveness of that strategy.